Loss of epithelial morphology and acquisition of mesenchymal characteristics, termed epithelial-to-mesenchymal transition (EMT), are typical for carcinoma cells and correlate with the local invasiveness and metastatic potential of the tumor.9 In our study, we looked at the role of EMT in precancerous lesions of the oral cavity and oropharynx (specifically decreased expression of E-cadherin and increased expression of vimentin) and sought to determine if the specific pattern of E-cadherin and vimentin expression could be used to predict invasiveness. This cross-sectional study looked at 87 cases of oral and oropharyngeal lesions from the Department of Pathology, Jawaharlal Nehru Medical College, Aligarh Muslim University, India, diagnosed from December 2012 to November 2014. Patients gave their informed consent and the local ethical committee approved the study. Fifty-three biopsies from the buccal mucosa, tongue, and pharynx and 34 resected oral specimens were evaluated for all premalignant and malignant lesions using routine hematoxylin and eosin staining and E-cadherin (Novocastra ready to use mouse monoclonal antibodies for E-cadherin, Novocastra), and vimentin (with DAB (3,3’-diaminobenzidine), Dako) immunohistochemical stains, wherever possible. 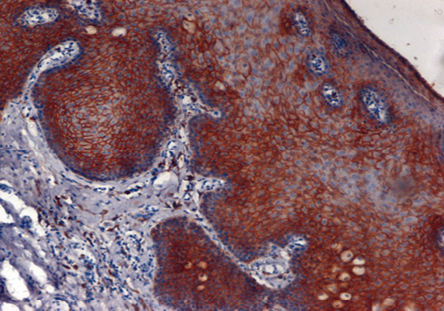 Immunohistochemical analysis, using rabbit and mouse antihuman polyclonal antibodies, was performed on the serial sections. Slides were examined for the staining pattern (cytoplasmic or membrane), proportion and intensity of staining of tumor cells. Patients follow-up and therapy-related changes were also studied. Grading of E-cadherin immunostaining was based on the percentage of cells stained10; 1+: < 10% positive cells; 2+: 10 to 20% positive cells; 3+: >20 to 50% positive cells; and 4+: > 50% positive cells. Grading of E-cadherin was also evaluated based on the location and intensity of staining;10,11 1+: absent membrane staining; 2+: weak/heterogeneous membranous staining; and 3+: strong/homogeneous membrane staining. Grading of vimentin was done on the basis of the stain intensity:12 1+: weak and focal staining; 2+: strong and focal staining; 3+: weak and diffuse staining; and 4+: strong and diffuse staining. For the statistical analysis, Fischer’s exact test was employed, and a p-value of < 0.050 was considered significant. There were 64 premalignant and 23 malignant cases in our study. Sixty-five cases (74.7%) were seen in males and 22 (25.3%) in females. Both premalignant and malignant cases were more prevalent in males compared to females. The majority of malignant cases (n = 15; 64.2%) were seen in the fifth and sixth decades of life while most of the premalignant lesions (n = 36; 56.4%) were seen in the fourth and fifth decades of life. The number of malignant cases increased with advancing age. Table 1: Expression of E-cadherin in premalignant lesions. Table 2: Comparison of E-cadherin expression pattern in dysplasias, carcinoma in situ and invasive carcinomas. Table 3: Comparison of vimentin expression pattern in dysplasias, carcinoma in situ, and invasive carcinoma. Amongst the 64 premalignant oral lesions studied, leukoplakia comprised of 14 cases (21.9%), out of which three cases had associated mild to moderate dysplasia. There were 16 cases (25.0%) of different grades of dysplasias along with 11 cases (17.2%) of carcinoma in situ, seven cases (11.0%) of lichen planus, six cases (9.4%) of erythroplakia, and five cases each (7.8%) of lichenoid dysplasia and submucosal fibrosis. Most of the premalignant lesions studied showed strong (4+) membranous immunostaining of E-cadherin (p = 0.853) [Figure 1 and Table 1]. The majority of premalignant lesions also showed weak (1+ or 2+) cytoplasmic immune-expression for vimentin (p = 1.000). Figure 1: Leukoplakia: Photomicrograph shows strong membranous positivity of E-cadherin (4+) in acanthotic squamous epithelium, magnification = 10 ×. 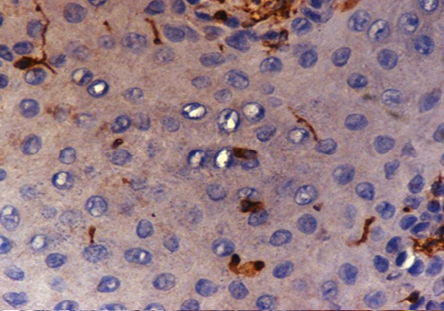 Figure 2: Moderate dysplasia: Photomicrograph shows moderate membranous positivity of E-cadherin (3+) in squamous epithelial cells, magnification = 40 ×. Figure 3: Mild dysplasia: Photomicrograph shows the absence of vimentin staining with few cells showing weak (1+) cytoplasmic positivity, magnification = 40 ×. Eight (80.0%) cases each of dysplasias and carcinoma in situ showed either negative or weak (1+/2+) staining for vimentin [Figure 3]. Seven (70.0%) cases of well-differentiated carcinoma showed negative/weak (1+/2+) vimentin staining, while six (60.0%) cases of poorly-differentiated carcinoma showed strong (4+), staining and four (40%) cases had moderate (3+) staining. No cases were negative for vimentin [Table 3]. Our study showed an increased expression of vimentin as the tumor progressed from dysplasias to carcinoma in situ to invasive carcinomas (p < 0.050). Our study showed positivity of different intensity of E-cadherin and vimentin expression in premalignant and malignant lesions. We observed a significant decrease in E-cadherin membrane expression from dysplasia to carcinoma in situ to invasive carcinoma and a significant increase in vimentin expression with progression of the tumor. Loss of E-cadherin and gain of vimentin is a hallmark of tumor progression and E-cadherin is a good prognostic marker whereas vimentin expression indicates a poor prognosis. In a study of 121 cases, Kaplanis et al,12 reported that high-grade squamous intraepithelial lesion (HSIL) and invasive carcinoma showed significantly reduced E-cadherin membrane expression and increased cytoplasmic immunoreactivity compared to the low-grade SIL (LSIL), atypical squamous cell of undetermined significance, and normal groups. The study concluded that decreased E-cadherin membrane expression appears to be a useful assessment parameter of the malignant potential of cervical lesions. Myong11 also showed loss of E-cadherin membranous immunoreactivity as the tumor progressed from carcinoma in situ, micro-invasive to invasive squamous cell carcinoma (49.0%, 23.0%, and 0% respectively). The differences in the immunoreactivities were statistically significant between carcinoma in situ and micro-invasive or invasive carcinomas (p < 0.001). Our study also showed statistically significant E-cadherin expression between dysplasias or carcinoma in situ and invasive carcinomas. Williams et al,13 found upregulation of P-cadherin expression in severe dysplasia and reduced expression of the E-cadherin and/or catenins in carcinoma in situ and infiltrating tumors. They concluded that disruption of the E-cadherin-catenin complex was a late event associated with invasion. 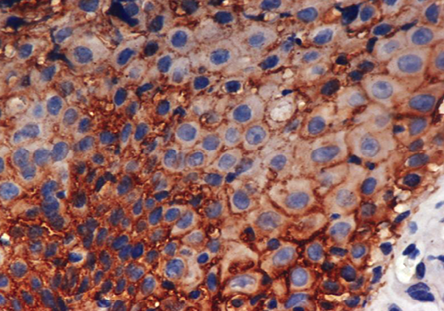 Myong11 reported that normal control tissues exhibited almost no vimentin immunohistochemical expression, and carcinoma in situ lesions showed 8.8% immunoreactivity. Microinvasive and invasive carcinomas showed a much higher vimentin expression in 53.0% and 67.0% cases, respectively, findings concordant with our study. Thus, significantly increased vimentin expression could be used as an important EMT marker in the progression of carcinoma in situ to microinvasive or invasive squamous cell carcinoma in human cervical tissues. Frixen et al,14 suggested that the ability of carcinoma to invade and metastasize largely depends on the degree of epithelial differentiation within the tumors after their study on various human cell lines derived from bladder, breast, lung, and pancreas carcinoma. They found that carcinoma cell lines with an epithelioid phenotype were noninvasive and expressed the epithelium-specific cell-cell adhesion molecule E-cadherin whereas carcinoma cell lines with a fibroblastoid phenotype were invasive with the loss of E-cadherin expression. Fan et al15 also suggested that weak E-cadherin expression was associated with a poor prognosis in oral squamous cell carcinoma. Invasiveness of cancer can be assessed using an immunohistochemical panel of E-cadherin and vimentin, which could help to predict the prognosis. We can use these biomolecules as biomarkers for further research on the microinvasion of oral cancers and to develop early diagnosis, and better treatment modalities and increase patient survival. Waldron CA, Shafer WG. Leukoplakia revisited. A clinicopathologic study 3256 oral leukoplakias. Cancer 1975 Oct;36(4):1386-1392. Bouquot JE, Whitaker SB. Oral leukoplakia–rationale for diagnosis and prognosis of its clinical subtypes or “phases”. Quintessence Int 1994 Feb;25(2):133-140. Silverman S Jr, Gorsky M, Lozada F. Oral leukoplakia and malignant transformation. A follow-up study of 257 patients. Cancer 1984 Feb;53(3):563-568. Mashberg A, Samit A. Early diagnosis of asymptomatic oral and oropharyngeal squamous cancers. CA Cancer J Clin 1995 Nov-Dec;45(6):328-351. Zain RB, Ikeda N, Gupta PC, Warnakulasuriya S, van Wyk CW, Shrestha P, et al. Oral mucosal lesions associated with betel quid, areca nut and tobacco chewing habits: consensus from a workshop held in Kuala Lumpur, Malaysia, November 25-27, 1996. J Oral Pathol Med 1999 Jan;28(1):1-4. Tilakaratne WM, Klinikowski MF, Saku T, Peters TJ, Warnakulasuriya S. Oral submucous fibrosis: review on aetiology and pathogenesis. Oral Oncol 2006 Jul;42(6):561-568. Silverman S Jr. Oral lichen planus: a potentially premalignant lesion. J Oral Maxillofac Surg 2000 Nov;58(11):1286-1288.
van der Meij EH, Schepman KP, van der Waal I. The possible premalignant character of oral lichen planus and oral lichenoid lesions: a prospective study. Oral Surg Oral Med Oral Pathol Oral Radiol Endod 2003 Aug;96(2):164-171. Hollier BG, Evans K, Mani SA. The epithelial-to-mesenchymal transition and cancer stem cells: a coalition against cancer therapies. J Mammary Gland Biol Neoplasia 2009 Mar;14(1):29-43. Kaur G, Carnelio S, Rao N, Rao L. Expression of E-cadherin in primary oral squamous cell carcinoma and metastatic lymph nodes: an immunohistochemical study. Indian J Dent Res 2009 Jan-Mar;20(1):71-76. Myong NH. Loss of E-cadherin and Acquisition of Vimentin in Epithelial-Mesenchymal transition are noble indicators of Uterine Cervix Cancer progression. Korean J Pathol 2012 Aug;46(4):341-348. Kaplanis K, Kiziridou A, Liberis V, Destouni C, Galazios G. E-cadherin expression during progression of squamous intraepithelial lesions in the uterine cervix. Eur J Gynaecol Oncol 2005;26(6):608-610. Williams HK. Molecular pathogenesis of oral squamous carcinoma. Mol Pathol 2000 Aug;53(4):165-172. Frixen UH, Behrens J, Sachs M, Eberle G, Voss B, Warda A, et al. E-cadherin-mediated cell-cell adhesion prevents invasiveness of human carcinoma cells. J Cell Biol 1991 Apr;113(1):173-185. Fan HX, Wang S, Zhao H, Liu N, Chen D, Sun M, et al. Sonic hedgehog signaling may promote invasion and metastasis of oral squamous cell carcinoma by activating MMP-9 and E-cadherin expression. Med Oncol 2014 Jul;31(7):41-44.